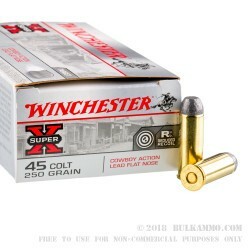 An exceptional price for very straightforward and high reliability .45 LC ammunition that is purpose-built for cowboy action shooting, with the traditional lead flat nose projectile at 250 grains. Winchester Super-X has a reputation that is virtually unmatched in modern ammunition, with the longstanding history of the line. 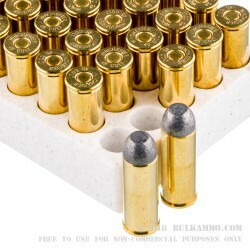 This load is a 250 grain all lead flat nosed projectile with a brass casing and a Boxer primer making it easily reloadable for all those who like to cast their own bullets or want to save a bit of money or resell their spent brass. 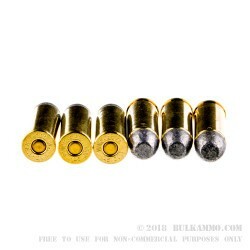 With this bulk ammunition deal the brass value is a huge added bonus. This is a simple, range round or for cowboy action shooting when specific requirements dictate that you need an all lead round. The ballistics are in the mid-range and these rounds generally aren’t suitable for home defense unless your preference is ball ammo. Where lead is allowed, this is suitable for short and medium range hunting on medium and large game. 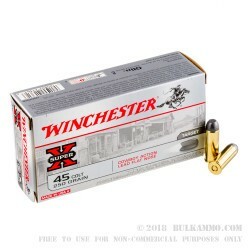 Consistency and reliability is the name of the game with Winchester Super-X .45 Long Colt. Its name brand, but value priced; offers good ballistics but isn’t dirty or difficult to shoot in a variety of firearms, including lever action repeaters. This is suitable for use in firearms marked “.45LC”.